Definition: DNA repair, any of several mechanisms by which a cell maintains the integrity of its genetic code. In human cells, both normal metabolic activities and environmental factors such as radiation can cause DNA damage, resulting in as many as 1 million individual molecular lesions per cell per day. DNA repair ensures the survival of a species by enabling parental DNA to be inherited as faithfully as possible by offspring. It also preserves the health of an individual. Mutations in the genetic code can lead to cancer and other genetic diseases. As a consequence, the DNA repair process is constantly active as it responds to damage in the DNA structure. 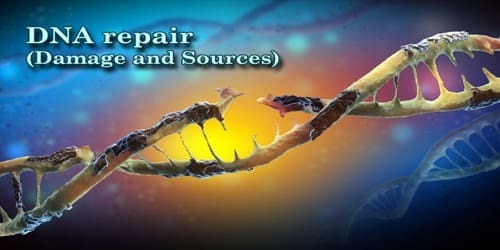 When normal repair processes fail, and when cellular apoptosis does not occur, irreparable DNA damage may occur, including double-strand breaks and DNA cross-linkages (interstrand crosslinks or ICLs). This can eventually lead to malignant tumors or cancer as per the two hit hypothesis. Successful DNA replication requires that the two purine bases, adenine (A) and guanine (G), pair with their pyrimidine counterparts, thymine (T) and cytosine (C). Different types of damage, however, can prevent correct base pairing, among them spontaneous mutations, replication errors, and chemical modification. Genomic mutations can also be carried over into daughter generations of cells if the mutation is not repaired prior to mitosis. Once cells lose their ability to effectively repair damaged DNA, there are three possible responses. The cell may become senescent, i.e., irreversibly dormant. In 2005, multiple laboratories reported that senescence could occur in cancer cells in vivo as well as in vitro, stopping mitosis and preventing the cell from evolving further. The cell may become apoptotic. Sufficient DNA damage may trigger an apoptotic signaling cascade, forcing the cell into programmed cell death. The cell may become malignant, i.e., develop immortal characteristics and begin uncontrolled division. 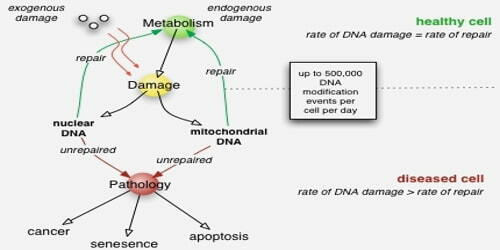 DNA damage and Sources: DNA damage, due to environmental factors and normal metabolic processes inside the cell, occurs at a rate of 10,000 to 1,000,000 molecular lesions per cell per day. While this constitutes only 0.000165% of the human genome’s approximately 6 billion bases (3 billion base pairs), unrepaired lesions in critical genes (such as tumor suppressor genes) can impede a cell’s ability to carry out its function and appreciably increase the likelihood of tumor formation and contribute to tumor heterogeneity. Often when DNA is damaged, the cell chooses to replicate over the lesion instead of waiting for repair (translesion synthesis). Although this may lead to mutations, it is preferable to a complete halt in DNA replication, which leads to cell death. On the other hand, the importance of proper DNA repair is highlighted when repair fails. The oxidation of guanine by free radicals leads to G-T transversion, one of the most common mutations in human cancer. DNA can be attacked by physical and chemical mutagens. Physical mutagens are primarily radiation sources, including UV (200-300 nm wavelengths) radiation from the sun. UV radiation produces covalent bonds that crosslink adjacent pyrimidine (cytosine and thymine) bases in the DNA strand. 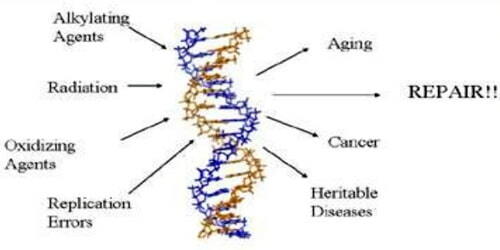 Ionizing radiation (X-rays) initiates DNA mutations by generating free radicals within the cell that create reactive oxygen species (ROS) and result in single-strand and double-strand breaks in the double helix. Chemical mutagens can attach alkyl groups covalently to DNA bases; nitrogen mustard compounds that can methylate or ethylate the DNA base are examples of DNA alkylating agents. Procarcinogens are chemically inert precursors that are metabolically converted into highly reactive carcinogens. These carcinogens can react with DNA by forming DNA adducts, i.e., chemical entities attached to DNA. It is important to distinguish between DNA damage and mutation, the two major types of error in DNA. DNA damage and mutation are fundamentally different. DNA damage can be recognized by enzymes, and thus can be correctly repaired if redundant information, such as the undamaged sequence in the complementary DNA strand or in a homologous chromosome, is available for copying. If a cell retains DNA damage, transcription of a gene can be prevented, and thus translation into a protein will also be blocked. Replication may also be blocked or the cell may die. However, infrequent mutations that provide a survival advantage will tend to clonally expand at the expense of neighboring cells in the tissue. This advantage to the cell is disadvantageous to the whole organism because such mutant cells can give rise to cancer. Thus, DNA damage infrequently dividing cells, because it gives rise to mutations, is a prominent cause of cancer. In contrast, DNA damage in infrequently-dividing cells is likely a prominent cause of aging.